From video games to big screen epics to weekly television fare, the zombie craze has reached a fever pitch. "World War Z: Rise of the Undead" looks behind the fiction to explore whether these nightmare scenarios might be possible in the real world. What results is an all too believable portrait that's as frightening as any crafted in a Hollywood studio. The notion of a zombie apocalypse might be far fetched, but nature can manipulate a reality that's close enough. Just one example involves a breed of wasp in Japan that lays their eggs in the abdomen of arachnids. Once inseminated, the spiders are thought to be influenced by the release of a mind-altering hormone that entrances them to protect the wasp eggs at any cost, even though they face imminent death once these eggs hatch. In the human realm, there is no shortage of illicit substances that can alter thought and consciousness. The nastiest of these is known on the street as krokidil - the zombie drug - and results in the disintegration of flesh and a staggering sluggishness that mirrors our media-driven visions of the walking dead. Improbable as it may be, if such a drug were to make its way into our water supply, the results might resemble a zombie-infected end of days. Humans are susceptible to a variety of influences that can render them in an unfamiliar state between the living and the dead. On the viral front, 70% of rabies cases involve involuntary outbursts of irrational behaviour, hyperactivity, and violence. In the arena of behavioural modification, a child can be conditioned to exist in a zombie-like mode for the remainder of their life. Then there are instances that defy medical explanation when the fallen return to life minutes and days after being pronounced dead. 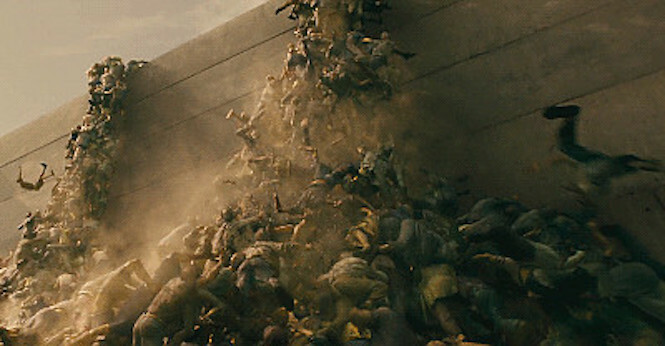 "World War Z: Rise of the Undead" features a myriad of truly disturbing images, including victims in the throes of convulsion, exposed bones behind slabs of rotting flesh, and rabies-infected sufferers frothing at the mouth. The flashes of carnage are brief but impactful and work to create a sense of authenticity and unease. For those who can stomach it, the film highlights reality's capacity to transcend even our most outlandish works of fiction.